We have trainers available to run a training workshop anywhere in Australia. If you belong to an organisation that might be interested in hosting such a workshop, please contact our office. Note that our workshop prices may vary, depending on location, reflecting our need to cover additional travel and accommodation expenses. To get news of new training courses as they become available, sign up for our newsletter. With the support of Bell Park North Primary School Community Hub, we will be running a Level One Facilitator Training Workshop in Geelong, Victoria on Monday April 29 and Tuesday April 30. Workshop runs from 9.00 am to 4.00 pm both days. Bookings close at noon on Thursday 25 April. Cost is $450, which includes training materials and catering. Click here for more information, and to book online. ​With the support of Latrobe Community Health Service, we will be running a Level One Facilitator Training Workshop in Ballarat, Victoria on Thursday May 23 and Friday May 24. The workshop runs from 9.00 am to 4.00 pm both days. Bookings close at noon on Tuesday May 21. Clost is $450, which includes training materials and catering. ​Click here for more information, and to book online. We welcome expressions of interest in Level One Facilitator Training from Aboriginal Community Controlled Organisations (ACCOs) across Victoria. In the past we have welcomed aboriginal participants to many of our training workshops in Melbourne, in regional Victoria, and interstate. The workshop will run from 9.00 am to 4.00 pm both days. Cost of Melbourne training: $410 per participant. Cost outside Melbourne to be determined, but typically $450 - $520 per participant (depending on number of participants and travel and accommodation costs for two trainers). Cost includes catering for two days, plus resources. 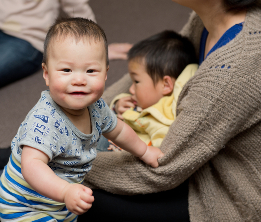 To express your interest in attending a training workshop in any area in 2019, complete the form on our School readiness funding page, or email us. The workshop will run from 9.00 am to 4.00 pm both days. Cost is $410, which includes the cost of training materials and catering. To express your interest in attending a training workshop in this area in 2019, complete the form on our School readiness funding page, or email us. Parent-Child Mother Goose Australia is always seeking opportunities to deliver its Level One Training Workshop regardless of location. In the past 24 months we have delivered training workshops in Shepparton, Murray Bridge, Ingle Farm, Swan Reach SA, Sydney, Albury-Wodonga, Bankstown, Burnie, Wagga Wagga as well as many workshops in Melbourne. The workshop will run from 9.00 am to 4.00 pm both days. Cost to be determined, but typically $450 - $520 per participant (depending on number of participants and travel and accommodation costs for two trainers). Cost includes catering for two days, plus resources. To express your interest in attending a training workshop in this area in 2019, complete the form on our School readiness funding page or email us.